Leonflix is a modular search tool for content. It crawls video/file hosting websites and can find and return the videos hosted on those sites. You can find more than just movies. Find semester-length video lectures from MIT's OpenCourseWare, or the complete Khan Academy video lesson series on AP Physics 2, all using the Modules built by the amazing members of our community. In today's world of streaming, every time a video changes hands, from the host to the site that shows it, more ads are added. By the time it gets to the viewer, the content has been "stepped on" so many times that it is nearly unwatchable. Leonflix's novelty is that it extracts only the desired content that streaming sites provide, filtering out all the pop-ups and adware that have been cut into the product. Ads, tracking, and micro-targeting are not only annoying, in the age of Evercookie, they are a violation of our civil liberties. Therefore, our mission is to provide a free and modular tool that's suitable for everything from education to entertainment, without all the adware, bulk data collection, and micro-targeting. P.S. Since Leonflix is still in beta, users may experience some bugs. We're actively working to fix those bugs while pushing out new features. You can join our community at r/leonflix to report bugs or make feature suggestions. We also have a Discord server! Yes, there are no subscription fees or ads. Does Leonflix host copyrighted videos? No. Leonflix is a media search tool. It does not host any copyrighted videos on its servers. 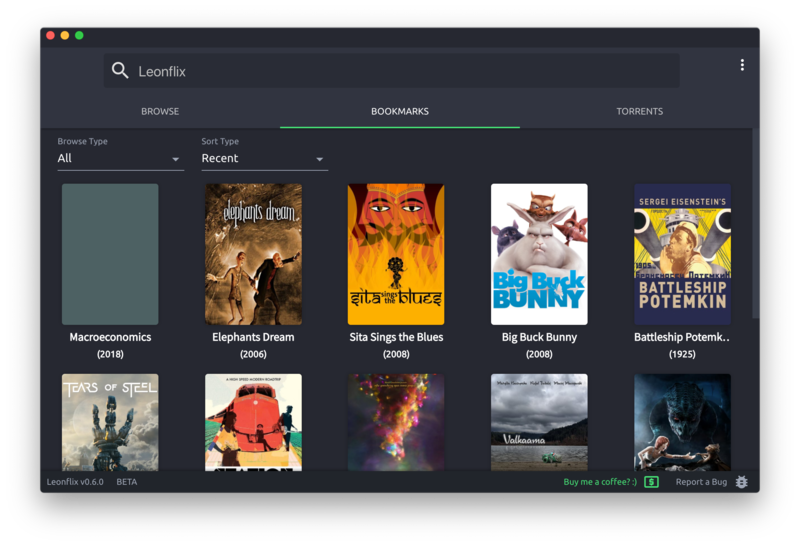 The maker of Leonflix does not condone the streaming of copyrighted content and intends that this tool be strictly used for searching open license or public domain movies and shows. The maker of Leonflix takes no responsibility for how Leonflix is used, and Leonflix does not remotely track or store any information regarding the browsing/streaming activity of its users. Modules are "addons" to Leonflix that users can install to find the content they want or to customize their experience. Leonflix modules are still in development, but eventually the module system will be opened up to all 3rd party developers. You can check out the currently available modules in Settings > Modules to get a taste of how they work. The goal is to expand on the types of media Leonflix can play as well as the protocols they can be played on. In combination with 3rd party modules, we should see some really interesting things in the future. After updating, I get the following error: "This file does not have a program associated with it for performing this action"
You can subscribe to r/leonflix for continued updates on the development progress. It's also a great place to look for answers to any problems you might encounter. Leonflix can't find sources for ANYTHING! Wtf!!??? As of now Leonflix is a desktop-only app and is not available on Android devices. There are plans to expand to Android one day, however improving the desktop experience is the main priority as of now. On Mac I get the following message: "Leonflix can't be opened because it is from an unidentified developer." Go into System Preferences -> Security & Privacy -> General, and click "Run Anyway." Click the lock to make changes if necessary. Click "More Info," and click the "Run Anyway" button. On Linux, how do I run the AppImage file?